Fancy double the trouble this year? Then take a look at these crazy couples Halloween costumes. These outfits are definitely unique and will have everyone looking twice, but that’s what Halloween is all about, right? It’s time to show your Bob Ross side, or unleash your moshing metal head. 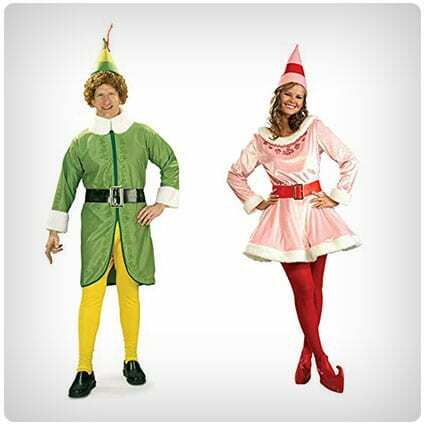 One thing you don’t expect on Halloween is the sound of jingle bells, but why not mix it up a bit and bring Christmas festivities to Halloween with these magical Buddy the Elf and Jovi costumes? The outfits come with everything you need to complete your elfy looks, right down to the adorable cone hats. Wow, this couples costume is totally fabulous, you have to agree. Fans of Bob Ross are going to find this absolutely hilarious and it’ll certainly make for some brilliant photos! The Bob part of the costume even includes his iconic curly hair and beard – not forgetting the paint palette, obviously. You could always take things way way way back to basics with this rather unique Adam and Eve costume from Fun World. You’re sure to grab everyone’s attention looking like you have both just traveled in from the garden of Eden, although at least you’ll still have your modesty with those strategically-placed leaves. Oh wow, everyone’s biggest fear is seeing this ghastly duo staring at them from down the hall. You and your partner or friend will have tonnes of Halloween fun scaring the heebie-jeebies out of the innocent bystanders. This eerie Grady Twins costume is handmade, so you can be sure they are built-to-last high quality. If you guys are planning on staying in and just entertaining the trick or treaters this year, then these ‘Netflix’ and ‘Chill’ shirts are definitely perfect for you. With these quirky shirts, you can easily look like you’ve put in the effort, even while staying in your pajamas – result! Get your rocks ON, honey – because it’s time to mosh and headbang your way through the night with these ultra stylish 80’s heavy metal inspired wigs. The pack comes with one blond wig and the other black – team them up with some black clothing and punky makeup and you’re both ready to party the night away. From RolePlayCouture on Etsy come these spectacular handmade Aladdin Family costumes. This wonderful set includes incredibly detailed costumes and accessories for Aladdin, Princess Jasmine, and the cheeky little monkey, Abu. These fabulous costumes will have you and your family looking absolutely amazing – you’re all sure to steal the show this Halloween. You simply can’t have a Halloween party without the classic favorites; Alice and of course, the Mad Hatter. These fab costumes literally include EVERYTHING you will need, from the oversized top hat right down to Alice’s white fluffy bunny. Plus, being from Wonder Costumes, you can rest assured they are sure to last many Halloweens!. Nothing goes hand in hand quite like wine and cheese – so they make the best costume for partners, right? Right. Take a look at this super funny perfectly paired wine and cheese set – it’s bound to have you both looking totally tasty. It includes the cheese tunic, a foam knife, and foam wine bottle. Whether you’re a group of friends, family, or siblings, this is the trio costume you’ve all been looking for. Welcome the rock, paper and scissors costume; this funny trio is certain to liven up any party, as you can really bring the classic go-to mini-game to life. Is it a running joke that you and your partner are a little nerdy? Then it’s time to take on that name and surprise your friends with this super silly couples Halloween costume – isn’t it fabulous? You could even step it up a notch and dress extra geeky with large glasses and strange hair-dos. If you’re always being naughty on the computer desk and putting your stick into ports, then this crazy couples costume is definitely the one for you. Sometimes you just need to put your scary hard drive on display for everyone to see, it’s to be expected on Halloween…right? Are you the ‘Pac’ to your man? Here we have the most fitting costumes for the pair of you, Mr. and Ms. Pac-man! These costumes are officially licensed and come with the Pac-man tunic, shoe covers, and gloves. They can also be worn 2 ways, so you can have it on your shoulders or head. Over on Morena’s Corner is this awesome DIY pinata and birthday boy costume – perfect for couples. The ‘birthday boy’ part is simple enough, simply just a badge, hat, and bat, though the pinata takes a tad more effort, of course. For that, you’ll need old clothes, foam, a glue gun and some patience. This fabulous blog post is sure to solve all your Halloween dilemmas if you’re looking for a pair of costumes for that most scary of nights. With 54 ideas and suggestions on how to achieve them, including Carl’s House and Russell from Up, the only dilemma you’ll have is which ones to choose! Did Cersei Lannister’s walk of shame rattle you to your bones? Since it’s Halloween, you can bring that horrid Game of Thrones scene to others with this crafty DIY couple’s costume from HalloweenCostumes.com. This wicked costume uses lots of fake blood, and we all know that’s plenty of fun to play with!